If you have been injured as a result of someone else’s negligence and you require medical treatment, you should visit your GP and/or local hospital and provide a full history of the incident and how your injury occurred. If at work or on someone else’s business premises contact the health and safety officer and make sure the incident is recorded in the accident book. Bring the incident to the attention of the relevant local authorities (for example, the police) as soon as possible. If you are a member of a trade union, contact your local representative or office. They will provide you with support and legal advice. Contact APIL who will put you in touch with a local personal injury solicitor who should offer you a free initial interview and you will be assured of independent, regulated legal advice. Personal injury is a complex area of law and voluntary accreditation schemes exist for lawyers which help you to recognise their individual skills and expertise. 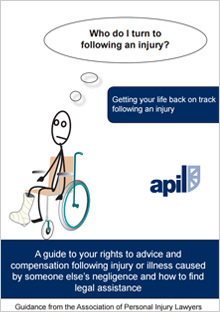 To find out more contact APIL (Association of Personal Injury Lawyers) or the Law Society. Your local benefits office will advise you on your entitlements whilst you are recovering from your injury. Be aware of claims farmers - middlemen who will simply sell your case on to a solicitor, for a fee. Insurers who are over keen to settle your claim quickly by discouraging you from seeing a lawyer.